This novel is outstanding! I cannot rate it highly enough. It is very moving and thought-provoking, with its brutally honest depiction, of the Bosnian War. This is without a doubt the most emotionally charged novel I have read this year so far! The novel opens with Inspector Esa Khattak giving prayer. Esa is immediately identified as a Muslim police detective, working within the community policing section. I found his characterisation brilliant. He is elusive and intriguing. Esa is called to a crime scene by Tom Paley a most respected historian at the Canadian department of justice. Tom believed Esa is the only one with the experience, training and vision to lead this case but urges Esa to take partner Sargent Rachel Getty to appear neutral. This is no routine case. Rachel Getty meets Esa at the scene and here we learn that Christopher Drayton has fallen to his death via an accident at the Scarborough Bluffs. So many questions swirled my head at this point. But the novel is very cleverly written in that it is a whole series of revelations that never let up. Christopher Drayton is well liked within his community and even referred to as generous and cultured. The scene is almost as much a mystery as the man himself. However, there are rumours and speculation within the department of justice that Drayton is not who he says he………..
Drayton is rumoured to be Drazen Krstic a fugitive war criminal fleeing a war crimes tribunal for genocide complicity, crimes against humanity, violence, murder and mass execution. Did this monster live amongst an unsuspecting community? Did Krstic seek redemption for his crimes? Was that part of his various roles in the community? Or did someone discover the truth? There are a series of chapters from a reflective viewpoint inside the Bosnian war of 1995. They truly depict war, its victims, violence, depravity and I found it terrifying reading. As a mother myself it was hard not to picture my sons in that position, living through the horrors of a war that leads to a genocide. I am not ashamed to admit that reading this novel, moved me to tears. This is also why I am glad that novels such as this exist. To educate the readers of the atrocities of the past and how we continue to make the same mistakes of the past, via religious persecution. Either by the violence we inflict ourselves, or like the UN, stand idle as the atrocities occur. These words are exceptionally powerful! I highly recommend this novel to all readers, particularly readers of literary and historical novels. But that should not distract from the fact that this is a solid crime fiction novel, with brilliant characters and plot. It is a huge pleasure to have Ausma on my blog. I was completely new to Ausma’s novels prior to April 2017. Ausma now sits in my list of favourite female authors and this is down to the pure genius behind her novel The Unquiet Dead. I cannot praise this novel enough, not only is it a solid crime fiction novel; it’s exceptional moving, with emotional scenes from the 1995 Bosnian war. Q) For the readers, can you give a brief summary of yourself, The Unquiet Dead and the Inspector Khattak series? A) I’m a British-born Canadian who currently lives in the United States. I used to practice immigration law and teach international human rights law, but now I write full-time. My books draw on my background in human rights, and I try to tell untold or forgotten stories about pressing human rights issues through the lens of two detectives who solve crimes. The Unquiet Dead is my mystery debut, featuring Inspector Esa Khattak and Sergeant Rachel Getty who work together in Toronto’s Community Policing Section. This book was followed by The Language of Secrets, the short story A Death in Sarajevo, and the third novel in the series Among the Ruins. I’m currently working on the fourth Khattak/Getty mystery. Q) Esa Khattak is a very intriguing character. He is well-written and I personally loved the diversity of a Muslim Inspector. Did you always plan to have diverse characters? What are your thoughts on diversity within the crime fiction genre? A) I’m a lifelong fan of mystery fiction and it is still my favourite genre to read. 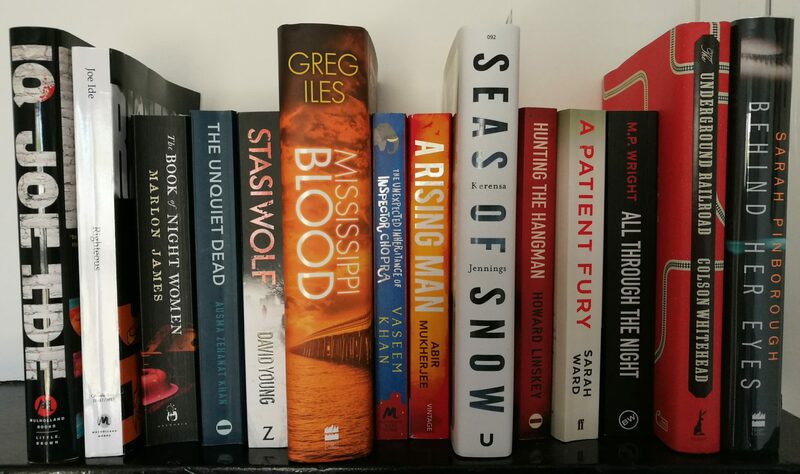 I particularly love British fiction and Scotland Yard mysteries, but yes I can’t help but notice the decided lack of diversity in the genre, both among authors and characters. I do think we need more fiction that is representative of the world we live in—fiction that seems real, multi-vocal, dynamic, and that challenges a single narrative or a single way of seeing and experiencing the world. With regard to my series, I’m simply writing my reality—the world I live in and know intimately, a world that I think is plural, mutually tolerant and inclusive, where people learn from each other all the time and are enriched by that learning, as I hope my readers will witness with Esa and Rachel’s partnership. Q) Esa Khattak and Rachel Getty are police partners within the community police section. Can you expand for UK readers what the community police section are and what they do? A) The Community Policing Section is an invention of mine, loosely based on a program run by the Royal Canadian Mounted Police in British Columbia. In my version of Community Policing, my two detectives operate under the aegis of Canada’s Department of Justice, and are invited to consult on investigations that involve in minority communities. They have a difficult, somewhat contradictory mandate: to represent the interests of those communities to law enforcement, but also to represent law enforcement within those communities. Q) The novel has a backdrop of the Bosnian War of 1995. I found this exceptionally moving, in fact it moved me to tears, more than once. What was the research for this part of the novel? Did you set out to place the reader in the position of a witness to the atrocities? A) My graduate research was on the subject of the Bosnian genocide. I wrote a Master’s thesis on the legal basis for the operation of the International Criminal Tribunal for the former Yugoslavia (the ICTY)—an international criminal tribunal was ground-breaking at that time. And then my dissertation went on to examine when and where there should be international military intervention for human protection purposes. The fall of Srebrenica during the Bosnian genocide was the focal point of my research. So I was immersed in war crimes testimony, refugee testimony, statements of Bosnian representatives to the United Nations Security Council during the genocide, and though I was a tertiary witness on the side-lines, I thought it was important to remember the voices of the victims. Since writing the book, I’ve often heard from readers that they remember the dissolution of Yugoslavia, but they had no idea of the terrible crimes that were perpetrated during the Bosnian war. Telling a story like this, I hope, is an act of witness—for myself and for my readers. Q) The novel has a theme of redemption. It is thought-provoking from the perspective of, if redemption is possible for war criminals. I adore the theme of redemption in novels, but this was the first time I felt very uncomfortable with the notion that, there can be forgiveness for such violent and sadistic behaviour. I kept having to pause the reading to digest the topics and thoughts. Was this your intention, to educate the reader and generate thought-provoking themes? A) I think the theme The Unquiet Dead is most concerned with exploring is the nature of justice. What do we imagine justice looks like? For some time, my research touched on international criminal law. I looked at the kinds of sentences handed down after war crimes trials, and I also considered the vast numbers of genocidaires who’d walked free, escaping any punishment at all. When genocidaires live and move and work among their victims, it raises the question of what justice really is. Is it a trial in a court of law that results in a lenient sentence? What can answer for an act as devastating as the Srebrenica massacre? I think it’s for my readers to decide whether justice has been done by the time they’ve reached the end of the book. And then to ask themselves, why they might feel uncertain or uncomfortable at its conclusion. Q) The novel also covers the theme of racial/religious persecution. Which I quote some powerful words in my review, that sadly, I feel would be relevant in 2017. I personally believe novels like this can break down barriers and as stated in my review, this is why I am so glad such novels exist. Along your journey of being a published author, have you noticed any change in your readership? What more can be done to break down barriers as a reader or writer? A) Like my characters, my audience is quite diverse. I think if you try and tell an authentic and honest story, most people will be able to relate to it. And it’s always worthwhile to be able to introduce readers to characters and stories they haven’t seen before, and to make them question their preconceptions about characters like these. I try to do that myself, to challenge my own assumptions and to dig deeper on subjects I think I know, to see what else I can learn. One of the great gifts of literature is that it humanizes us to each other. That’s something we need more than ever today, to be able to perceive the humanity of the Other. Q) The setting of the novel is the Scarborough Bluffs in Canada. As a UK reader, I had to search via google images, to get an idea of the location. It truly is picturesque and unique. (I shall try add some images for readers). What was the inspiration behind the setting? A) Ah, great question! I lived on the Scarborough Bluffs when I was a child. I used to walk home from school on a path along the Bluffs, so to me the Bluffs always had a magical, almost unearthly quality. I knew even then that they’d make an atmospheric setting for a story. Q) What are you currently working on? Will there be future Khattak novels released in the UK? Do you write any other series? A) Yes, the Khattak/Getty novels are all due to be released in the UK. I’m currently working on the fourth book in the series about the Syrian refugee crisis. And at the same time, I’m writing a fantasy series for Harper Voyager US and UK. The first book in the series is called The Bloodprint, and it will be released simultaneously in the US and the UK, this October. Finding The Bloodprint promises to be their most dangerous undertaking yet, an arduous journey that will lead them deep into Talisman territory. Though they will be helped by allies—a loyal ex-slave and Arian’s former confidant and sword master—both Arian and Sinnia know that this mission may well be their last. *Huge thanks to the very talented Ausma Zehanat Khan for taking part in this Q&A on my blog. I wish you huge success with the release of The Unquiet Dead in the UK this July 2017.